Most of Cochran’s sessions took place at the Goldstar Studios at the busy intersection of Santa Monica and Vine. 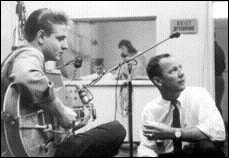 In 1956 it was a very small studio housed in a one story shop and very popular as a demo studio with the pre-rock songwriters of the day. When the hosiery shop next door went out of business, Goldstar expanded by taking over the premises and constructing a larger “A” studio in which an echo chamber was installed that was so deep that the studio’s future reputation would center around it. Cochran had also recorded another fine rocker titled “Pretty Girl” (co-written with Capehart) which stayed in the can for a couple of months before being released as the B side of his next single. Numerous takes of this number were made in a variety of tempos and shading before it was finally discarded. It eventually surfaced on a variety of European releases during the 60’s. “Jennie, Jennie, Jennie” was Cochran’s first release of 1958 and came out at a time when competition in the field was more intense than it had been a year earlier. The winter of that year was probably one of the most exciting and most competitive seasons ever for new singles with hundreds being issued every week. It would take more than an honest to goodness rocker such as “Jennie, Jennie, Jennie” to re-establish Cochran although the record did sufficient business to scrape up to No.94 for one week in March. Cochran followed up with “Theresa”, a graceful and melodic rock ballad that traded off Cochran’s ever-so-earnest vocals against a softly cooing girly chorus, but time had been kinder to the B-side, “Pretty Girl”, a savage rocker which picked up where “Jennie, Jennie, Jennie” had left off. Although Cochran was working steadily doing studio dates and public appearances, he needed a hit record to lift his career. “Theresa” has bombed out. “Love Again” c/w “Summertime Blues” was rush-released on June 11, 1958 – only one month after the single “Theresa” had bombed. Some of the biggest hits of the 50’s and 60’s started out as B-sides, “Summertime Blues” was another record destined to confound its’ birthright. In any event, it didn’t stay a B-side for long! Most of the trade reviews chose it in preference to “Love Again”, as did DJ’s. Something of a “sleeper”, it entered the “Hot 100” two months after its’ release and eventually peaked at No.8. But it was more than a hit, it was a classic! After “Summertime Blues” had run its course, Cochran and Capehart turned their thoughts to a follow up. An infectious guitar figure again formed the basis of the new song which was similar to “Summertime Blues” yet different enough to be regarded as a classic in its’ own right. The master was again built up in layers, with lashings of acoustic guitar, a folksy tambourine beat and a few well placed foot stomps to emphasize pauses in the song. In their search for the ultimate commercial denominator, Cochran hedged his bets by recording two slightly different sets of lyrics set to the same backing track. Opinions were canvassed and a decision was made to release “C’mon Everybody” (which made No. 35 in the States and N0.6 in the UK). “Summertime Blues” and “C’mon Everybody” established Cochran as a durable talent and brought him back into the limelight at a time when the American pop scene was entering a transitory stage. Connie Smith had married and came off the road and Eddie had to put together a semi-permanent band which he named “The Kelley Four”. Members of “The Kelley Four” played on most of his 1959 sessions including “Weekend” and his idiosyncratic version of Ray Charles’ “Hallelujah, I Love Her So” , which had a commercial string line added prior to release. In between, he cut “Something Else”, his most enduring record since “Summertime Blues”. Sharon Sheeley co-wrote the song with Eddie’s brother Bob which reached No.58 on the charts in the summer of 1959 and helped keep Eddie’s name in the limelight.